This is the third of three lessons in the “Follow Me” discipleship series from the 2014 Harvard Avenue College/Career Ministry Spring Retreat. In this series, we’ve explored what it means to be a disciple of Christ. We looked at Jesus calling His first disciples and saw that the call of discipleship is initiated by God towards rebels dead in sin unto adoption as sons. This involves both belief and repentance. Next, we saw that the cost of discipleship requires loving family less than Jesus, bearing our cross, and relinquishing everything. Even though this cost seems high, what we get in return is infinitely more valuable: the righteousness of Christ. We’re going to wrap up our “Follow Me” study by looking at one of the first and last things Jesus gave to His disciples while on the earth: the command to make disciples. True disciples of Jesus Christ are supernaturally compelled to make more disciples. Notice in these two passages that Jesus doesn’t suggest that His followers make disciples. He doesn’t highly recommend it. He didn’t teach them the latest evangelism technique or instruct them on how to be a role model. No, Jesus gave them a clear command: “Go and make”. From the very beginning, Jesus intended for every disciples to make more disciples. It is also important to note that He doesn’t give them this command and leave them to figure it out on their own. On our own, we are destined to fail. That’s what’s great about being a follower of Christ: He doesn’t leave us alone! The commands that Jesus gives His disciples can only be accomplished by the work that He does in them. In Matthew 4, He promises to make them fishers of men while in Matthew 28, Jesus tells His followers that He may be leaving them physically, but He will always be with them in the presence of the Holy Spirit. This Holy Spirit continues to mold and shape us into the image of the ultimate Disciplemaker. The entirety of the Christian faith is dependent on the resurrection of Christ (1 Corinthians 15:12-26). We believe in a living, reigning Savior who is now the exalted head of the church, who is to be trusted, worshiped, and adored, and who will some day return in power and glory to gather His Bride the Church and reign as King over the earth. In His resurrection, Jesus secured for us a new life like His: a human body and spirit perfectly suited for fellowship and obedience to God forever (1 Peter 1:2-5). We have been “made alive together with Christ and raised up with Him” (Ephesians 2:5-6). The reality of the resurrection gives us the power needed for Christian ministry and obedience to God (Philippians 3:10). This resurrection power also allows us to gain more and more victory over the sin that remains in our lives (Romans 6:14; 1 Corinthians 15:17). In baptism, we see this pictured (Romans 6:4,11). By raising Jesus from the dead, God declared His approval of Christ’s work of redemption on the cross (Romans 4:25). God was essentially saying there was no penalty left to pay for sin, no more wrath to bear, and no more guilt or punishment. All had been completely paid for by the substitionary, atoning death of Jesus. In saving us, by virtue of our union with Christ, God’s declaration of approval of Jesus is also His declaration of approval of us. Because of the resurrection, everything we do on earth has eternal significance, both for us and for others. Though we may face struggles and trials here on earth, we are promised a heavenly reward where our suffering for Christ will be repaid (Colossians 3:1-4). 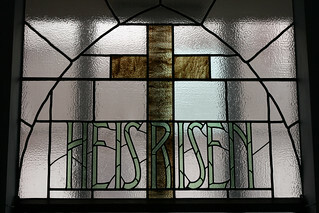 This Easter, remember the vital importance of what we are celebrating: Christ, as an innocent substitute, died the death that we should have died for our sins and then, to show His acceptance of this sacrifice, God the Father raised Jesus from the grave three days later, accomplishing the final victory over sin and death and making the reconciliation between God and humanity possible. What an amazing day! This is the second of three lessons in the “Follow Me” discipleship series from the 2014 Harvard Avenue College/Career Ministry Spring Retreat. How would you respond if someone asked you: “How do I become a Christian”? There are two ways to reply when asked this question: 1) Tell someone how easy it is: just acknowledge a few truths about God and then pray a prayer and you’re set! 2) Tell the person that the call to discipleship is a call to die so that they can live. So, which of these is correct? What does it mean to truly, biblically follow Christ? Does it look different in a third world country as opposed to America? What does it mean to know Jesus and identify your life with His? In other words, what does it mean to be a Christian? This is the first of three lessons in the “Follow Me” discipleship series from the 2014 Harvard Avenue College/Career Ministry Spring Retreat. Jesus first spoke the words, “Follow me” to twelve ordinary men two thousand years ago. They answered the call, leaving behind their families, friends, and jobs, to follow a Man who would give them a new family, new friends, and a new mission. Ever since that time, Jesus has called out to millions with the same two words: “Follow me.” Men and women, rich and poor, young and old, red, yellow, black, and white have responded to this summons. But what is Jesus asking us to do when he says “Follow me”? Is it simply to “pray and ask Jesus into your heart”? Do we just have to gain an understanding of who Jesus is and what He did? Or is it something more? This series of blog posts will be looking at three components of Jesus’ call to “Follow me”: the call to discipleship, the cost of discipleship, and the command to disciple. Along the way, we will see not only the gravity of what we must forsake in this world but also the greatness of the One we follow in this world. In Him is found indescribable joy, deep satisfaction, and an eternal purpose. Believing Jesus is fundamental to following Jesus. Becoming and being a disciple of Jesus involves far more than mere intellectual belief in Him (the demons even believe that Jesus died and rose again-James 2:19), but it certainly doesn’t involve anything less than that. Many profess publicly to a belief that they don’t actually have personally (Matthew 7:21-23). To believe in Jesus requires an obedience that encompasses trusting the claims He made about Himself, relying on the promises He made to those who would follow Him, and being devoted to the very words He spoke (John 8:31-38, 14:26). As we continue to “be transformed by the renewing of our minds” (Romans 12:1-2), we gain a deeper and deeper understanding of who Jesus is and what He has done on our behalf. On the other side of the discipleship coin is repentance. When someone repents, there is a foundational transformation in the person’s mind, heart, and life. Like the disciples that Jesus called, a repentant man or woman willingly leaves behind their former way of life with its idols, sins, and self-righteousness in order to run to answer the call of a new way of life as a follower of Jesus. For every Christian in every culture, repentance is a necessary element of discipleship. There are few doctrines more despised by the prideful human mind than the truth that God is absolutely sovereign. However, this truth is seen over and over throughout the pages of Scripture. Like the nation of Israel in the Old Testament (Deuteronomy 7:6-8) and the four Apostles in this Matthew passage, God initiates the call to discipleship. He does so based on His mercy not because of who they are, but often in spite of who they are. Like a Good Shepherd, He goes searching for the sheep that belong in His fold (John 10:1-18). He has to. The reason that God has to initiate discipleship is because in our natural sinful state, not even one person willingly seeks for God. Our identity is too wrapped up in our jobs, family, social status, pleasure, and self-righteousness. In fact, we sin has distorted us so much that the Bible refers to everyone’s natural state as “dead in sin.” Because of this sinfulness, we are under the just wrath of God. The penalty for this sin isn’t determined by our measure of it, but instead the penalty is determined by the magnitude of the one who is sinned against. So our problem isn’t so much that we’ve made bad decisions or messed up, but that we have rebelled against God and as a result are utterly unable to turn to Him. Adoption is at the heart of Christianity. God not only takes initiative, He takes initiative towards people in rebellion to Him. His aim isn’t to capture these rebels as P.O.W.s, but to bring them into His very own family so that they cry out “Abba! Father!” (Romans 8:15; Galatians 4:6). Before we were even born and while we were lying alone in the depth of our sin, God was planning and working to adopt us. For more on what it means to be a disciple of Jesus, check out David Platt’s book Follow Me: A Call to Die. A Call to Live.